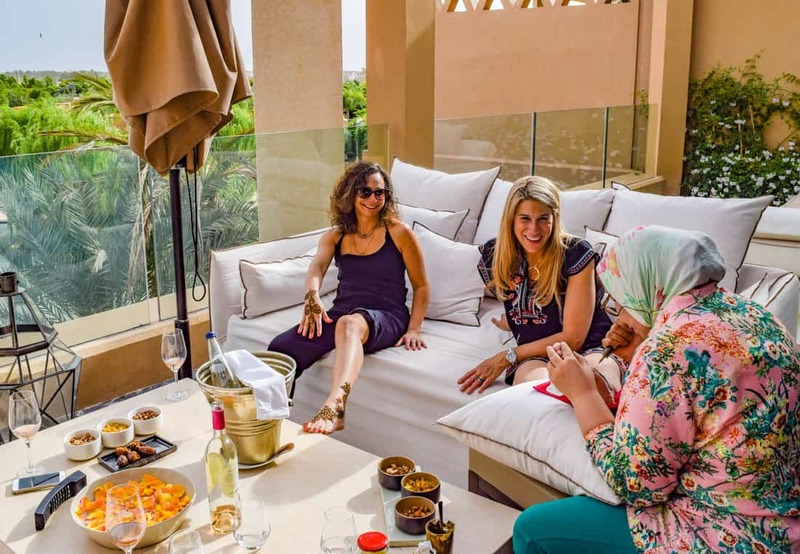 Sitting over looking this Atlas mountains from our villa at the Mandarin Oriental Marrakech with chilled bottles of Rosé, fresh dates and walnuts, is the reason l love girls trips. It’s exotic, indulgent, and oh. so. fab. I’m a big believer in the girls getaway. I love the way it redefines me and my friendships. Suddenly, I’m Stephanie again, not mom, not Andrew’s wife, not the forever class parent. I’m me, and I’m free! Girls week-ends are necessary and cathartic. As moms, we all do for everyone else and do for ourselves last. On holiday, sans enfants, we get to be the people we feel like being every day. 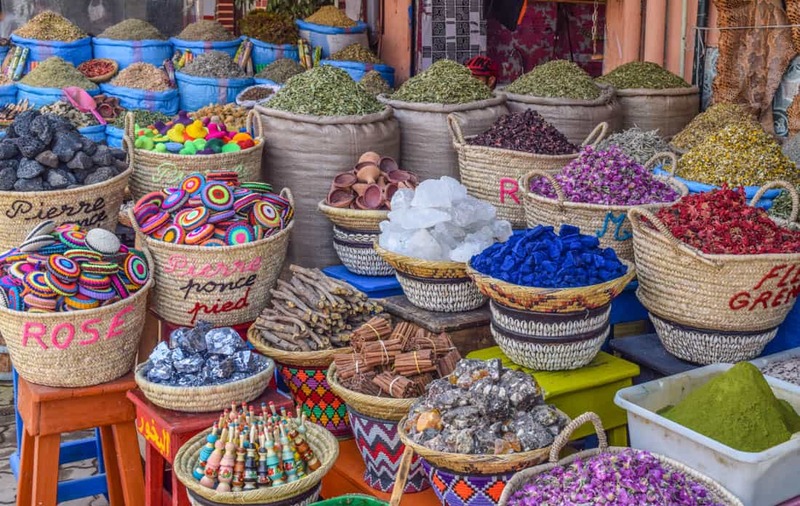 On this trip, I felt like shopping, sunning, spa-ing and perhaps sousing with a crisp white wine – there’s no better place for that then Morocco! 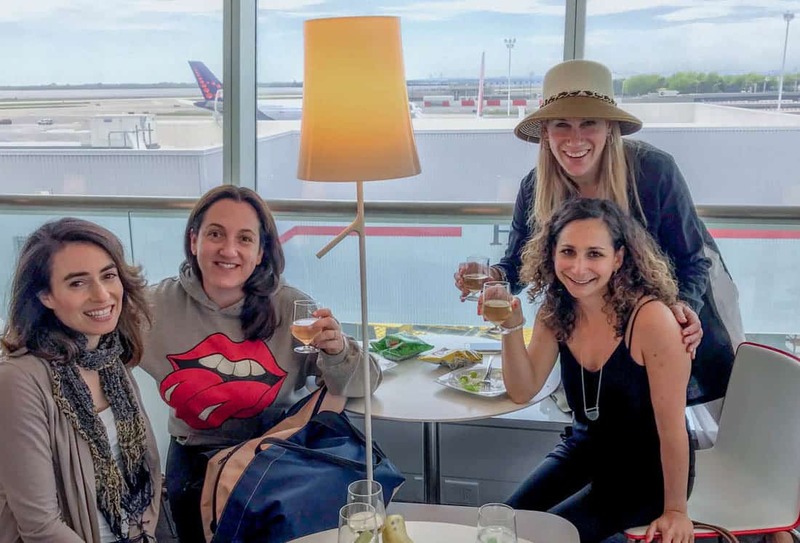 Those were the words exchanged over and over in the Air France Lounge by the four of us as we were about to embark on a 6-day girls trip to Marrakech. Champagne was poured, glasses clinked and soon each of us was sound asleep on the plane with thoughts of foreign lands and six blissful child-free days. Marrakech here we come! Marrakech came to light as sort of a joke, until it wasn’t. We were sitting around at a lovely mediterranean restaurant in October, and one of us waxed on about Morocco, its food, and then I chimed in about the shopping. Oh, the shopping. And so, a trip was born. A few hundred texts, four absolutely necessary wine bar summits, and one email confirmation from my travel agent, and we were off! I get almost giddy while packing a carry-on filled with magazines and six lip glosses rather than string cheese that will be rejected and Captain Underpants books. Dare I say that I actually read two novels on this jaunt? It was amazing. We arrived in Marrakech tired and hungry. 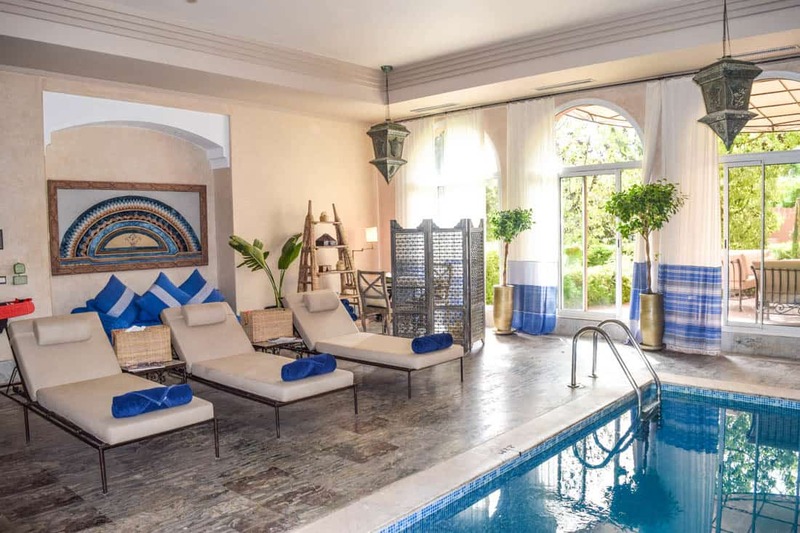 Thankfully, we had booked a large two bedroom, two bathroom suite at the Mandarin Oriental (check your dates for rates) replete with two private plunge pools called the Oriental Pool Villa. We wanted our hotel to be a haven, and we knew that we would need ample space for all of us, and there was plenty. Our room was spectacular with sweeping views of the Atlas Mountains. We dove into the plunge pool, ordered up some lunch and felt refreshed enough to venture out! We were so tempted to hit a few more stores, but five o’clock was rapidly approaching. We had made arrangements for a local henna artist to meet us at the hotel. The sheer indulgence and exoticness of having henna done on our private terrace while drinking wine is a memory I will have forever. Our artist was lovely, and communicating in my passable French (as she spoke no English) was delightful. We spent two hours with her, and each of us delighted in our painted hands and feet. The whole experience was surreal. We hired, prior to our stay, a private driver and guide through Heritage Tours. While Heritage is on a lot of radars for being one of the best tour companies around for Morocco, this was my first time using them, and I could not have been more thrilled. Our guide Adnan, was fantastic, as was our driver. Marrakech is safe and taxi’s are cheap and plentiful, but as four women who had a lot of ground to cover and a short time, we felt better with a car, driver, and guide at our disposal. Adnan also helped us make dining arrangements, confirm spa treatments, recommended places along our route to stop and made us feel like VIPS. There’s nothing like walking out of a dusty, dirty souk, bags dangling, and being whisked into an air conditioned van. Especially in 104 degree weather. We decided to take it easy our first day so we headed to Jardin Majorelle, the gorgeous botanical garden filled with exotic landscapes and bright cobalt blue paint. The garden was bought by the designer Yves St. Laurent and Pierre Berge in 1980 and after YSL’s passing in 2008, his ashes were scattered there. The garden is vibrant, both electrifying and calming at once. We toured slowly, enjoying the shade and the scenery. All of us were fascinated by the Berber museum, dedicated to preserving the history of this indigenous tribe of North Africa. After an hour of staring at their art and their jewelry, we decided to hit the shops ourselves. Across from the Jardin, sits 33 Rue Majorelle, a concept store that could easily rival Collette in Paris, with much better prices. Every item here is more gorgeous than then next. We could not help but fill the back of our lovely van with handbags, placemats, earrings, and hats. We had planned for one shopping day in the souk, and one day at the hotel pool but the minute Adnan led us through winding back alleys passing snake charmers and tea sets, we were hooked. Handmade woven clutches ? We’ll take three. Real argan oil? Pack it up. And, oh, the caftans. The souks are an actual treasure trove but you need patience, good bargaining skills, and good shoppers eye. Thankfully, between the four of us, and Adnan, we had all of the above. The souks are not for the faint of heart, and I recommend if you go you start in Souk Cherifa. It’s a quieter, gentler part of the Souk with small, gorgeous shops. Around the corner, is the famed Terrace D’Epices which is well worth a stop for a meal but avoid it midday as it gets brutally warm. After buying up much of Souk Cherifa, we were ready to test our skills on the maze of other souks. This is where having Adnan was amazing; he guided us with ease through the slipper souk, the silver alley, and of course, Jemaa El Fnaa, the main square. Jemaa El Fnaa is the center marketplace in Marrakech replete with dancing monkeys, fortune tellers, snake charmers, dancers, magicians and Berber story tellers. It is an overwhelming fantasy for the senses. The next morning, we headed into the old town for some shopping, more specifically Atika for shoes and Lalla for handbags. After stocking up on fabulous leather sandals, beach totes, and clutches we headed back to the souk. 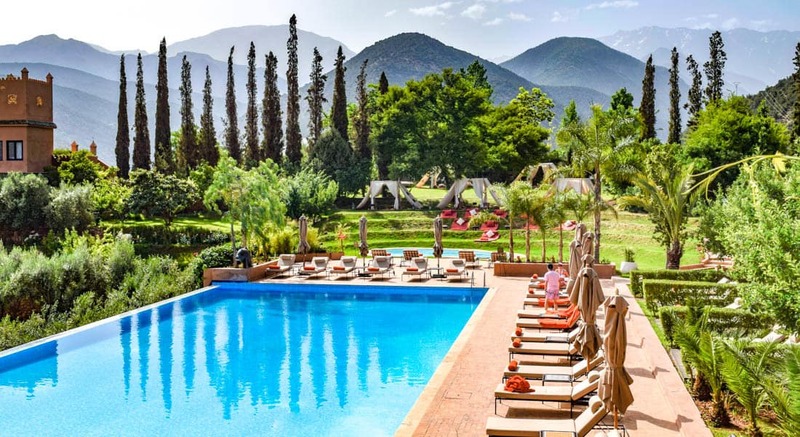 We were off to Kasbah Tamadot, Richard Branson’s retreat overlooking Mount Toubkal and many Berber villages. Instagram-able heaven is right, this place is over-the-top wow. Check your dates for rates. We had scheduled a traditional hammam, where black soap is applied all over the body and then the dead skin sloughed off with a mitt. While our skin glowed for the rest of the trip, I will mention that nothing bonds four friends together more then being naked together in a steamy room while buckets of cold water are thrown at your body as women scrub your skin until it’s raw. Sounds scary? Not all all, it was awesome. Tamadot also served up the best food of the trip, and we had a sumptuous lunch overlooking the hills. All too soon, it was time to leave Tamadot and head back to Marrakech and we decided that the perfect way to round out our day was with drinks at the famed La Mamounia gardens. Check your dates for rates. After a day being wowed by the souk, we decided to put on our new frocks and head out belly dancing. To say that Marrakech had charmed us would be an understatement. We felt as vibrant and alive as the city. La Mammounia is an incredible palace hotel worth a drink or a meal even if you stay elsewhere. A round of icy martinis later, we were ready to head out to Dar Moha for dinner, a spectacular restaurant in a riad once owned by the late Pierre Balmain. Tables cluster around the pool, the bottom of which is painted to resemble an oriental carpet. The food is traditional, plentiful and delicious. And the setting is magical. We ate a lot; we were fueling up for our big shopping day in the souk. Belly dancing at Comptoir Darna is absolutely must do. While I’m not for cheesy attractions, this restaurant was sultry and chic. 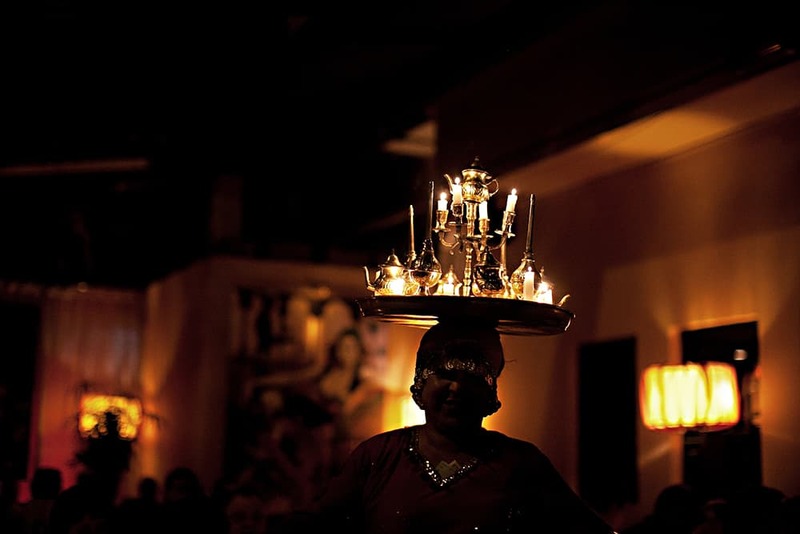 Dim lighting, plentiful wine and towers of Moroccan salads abound while the belly dancers glide by your table almost as illusions. Drinking and Dancing at Comptoir Darna, Marrakech. Photo courtesy of the Comptoir Darna. Fueled by glasses of Moroccan red and fatigued after our own belly dancing attempts, we decided to unwind back at our hotel and try the hookah Bar. While none of us are smokers, we could not resist the allure of the candlelit lounge, decorated to look like an authentic Berber village. We ordered a vanilla apple hookah, sat, smoked, and laughed. Girls weekends are defined by moments like this, when you do something so out of character that you feel yourself transforming and relaxing. 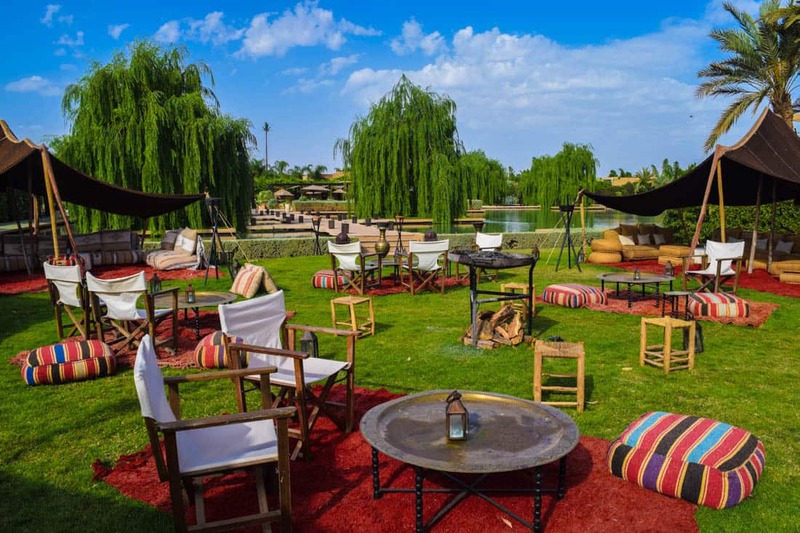 A day filled with treasure hunting and night filled with hookah and belly dancing is the epitome of luxurious and exotic; basically the most perfect day. As it was our last day, it was time to say good-bye to Adnan and pack up. We spent our final dinner at La Maison Arabe in the medina. The restaurant was not as spectacular as the others but perhaps we were a bit jaded and spoilt at this point. The interior was exquisite, and we were glad we spent each night doing something different. 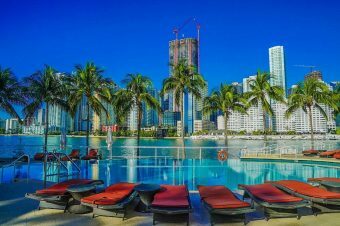 For this trip we stayed at the Mandarin Oriental. On a prior trip with the kids, I stayed at the Four Seasons. Both hotels are stunning, but for food I choose the Mandarin Oriental, and for concierge and the service, I choose the Four Seasons. The Mandarin Oriental is a newer property, and they’re still working out their service kinks. As the more established chain, the Four Seasons, has service down to a science, and their concierge blew me away. Check your dates for rates. 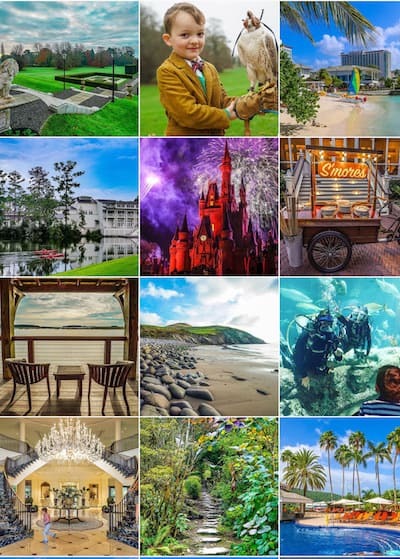 We also stayed at the Four Seasons with our children, and while there is no kids’ club per se, there were plenty of activities on hand for my son, and they had plenty of amenities for him. 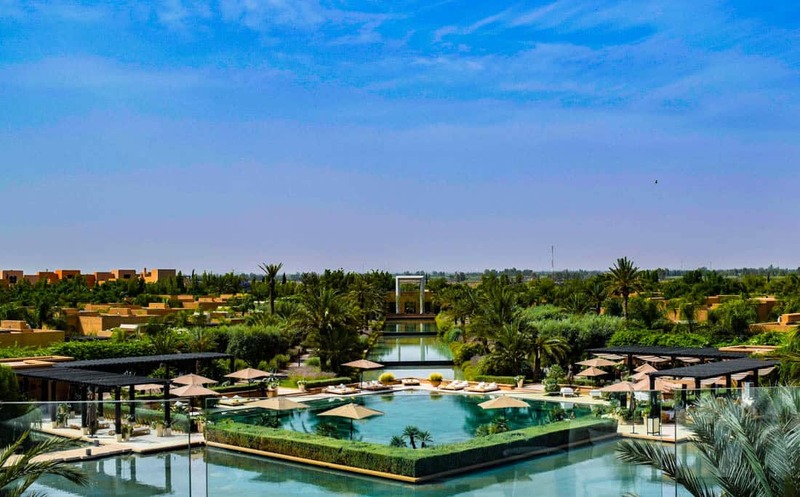 The Four Seasons in Marrakech has a special family pool. I can’t compare that the Mandarin Oriental as I was delightfully child free, but the Four Seasons also has a children’s pool. 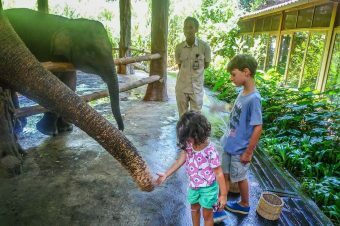 It’s worth noting that Tamadot has a gorgeous kids’ program that is specifically tailored to each family. The next time we go to Morocco with the kids, I’ll be heading there. Our four days had flown by, in a hazy blur of perfection. We were saddened to leave Marrakech but excited as we had to do a one night stop over in Paris, staying at my favorite hotel, Le Meurice. What a treat to stay at Le Meurice twice in less than a month and once without the kids! 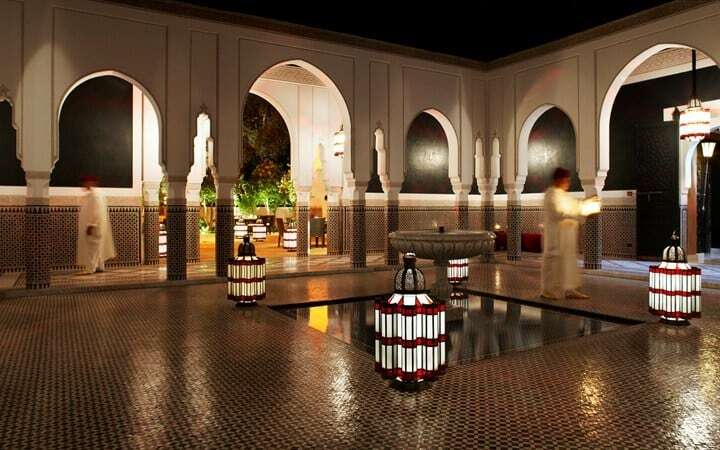 We returned from Marrakech and our one night in Paris relaxed and rejuvenated. Our kids delighted in the fez hats, genie lamps, and mini caftans we brought back. And the very next morning, as we met at school drop off each of us wearing a sparkly tunic rather than our yoga uniform, we knew that an annual girls trip had been born. We may not rock the casbah next year though. We’re retiring our belly dancing skills to learn line dancing in Nashville!